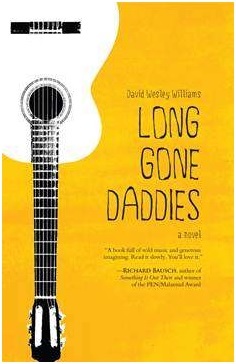 Long Gone Daddies by David Wesley Williams (broadcast 7-15-2013) A tale told to the cadence of a rocking chair on a porch back of the house on a summer night, fireflies, maybe a guitar strum now and again, a sip of something. Long Gone Daddies is written like a song for anyone who has ever responded to the rhythm of the road and the wail of southern blues or wished they had the nerve to try. Luther Gaunt follows the trail of the men of his line before him through the back roads and music joints of the South carrying Cassie, the guitar that seduced them all. He’s looking for his history and the song waiting for him around the next corner. He finds it all and more than he wanted when he and his bandmates, Jimmy Lee Vine and Buck Walker, meet up with Delia, who could sing the songs into your soul and wanted to ride them to fame and fortune. With Memphis as much as a player in the story as any, Williams doesn’t explain the whys and wherefores of the people who live for the songs, he tells their stories the way they would want them told, with heart and a good downbeat. Along the way he brings us a taste of the lives that benefit us all with their music but one few of us would dare to live.